This is exciting stuff for Mrs Madden! 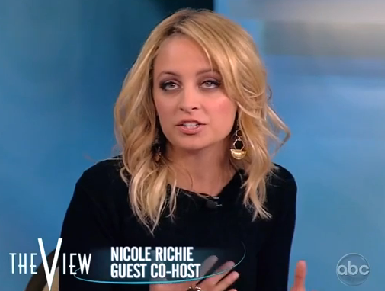 Nicole Richie was a guest co host on The View today, click here to see a clip of Nicole Richie talking about Charlie Sheen and his need to take responsibility for his actions. What are your thoughts on Nicole as a co-host? I think she would make a great permanent fixture. It's not like Nicole herself is sober, though - it's pretty well known she still goes out drinking. I always find it weird that people refer to Nicole as someone who got sober and who could give advice on sobriety to another person. Not that she claims she is sober, of course. Wasn't Nicole supposed to be on Diane Sawyer too (like a couple of months ago):)? i hate to say this but she's become so boring. all of her interviews are rehearsed and dull. part of her appeal was her outspokenness and off the wall behaviour. very blah now.